There is some confusion as to when Christmas officially ends. The Church of England insist Twelfth night is Jan 5th and therefore ended yesterday, but many people believe Twelfth night falls on the Jan 6th, at the end of the 12th day of Christmas and so will be keeping their decorations up until the end of today. The reason this is important for this review is that today is our very last ‘Christmassy’ post and we don’t want bad luck raining down on us if we dare show an image of a bauble. Nowhere on earth does Christmas as well as an English country village. 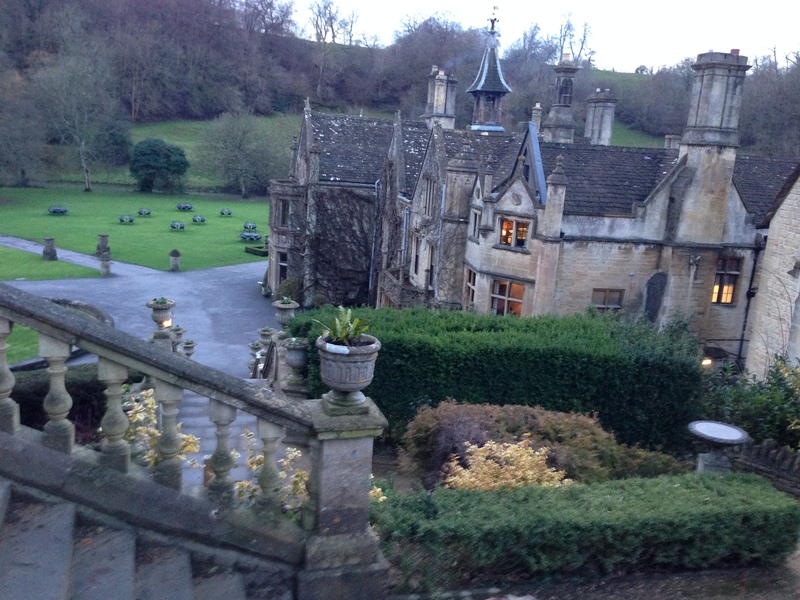 As the multiple winner of ‘Prettiest Village in England’ it follows that Castle Combe in Wiltshire should be a top choice to visit during the season – and so it is – an enchanting village with a stunning 14th Century Manor House, now a luxury five star hotel with its own Michelin starred restaurant. 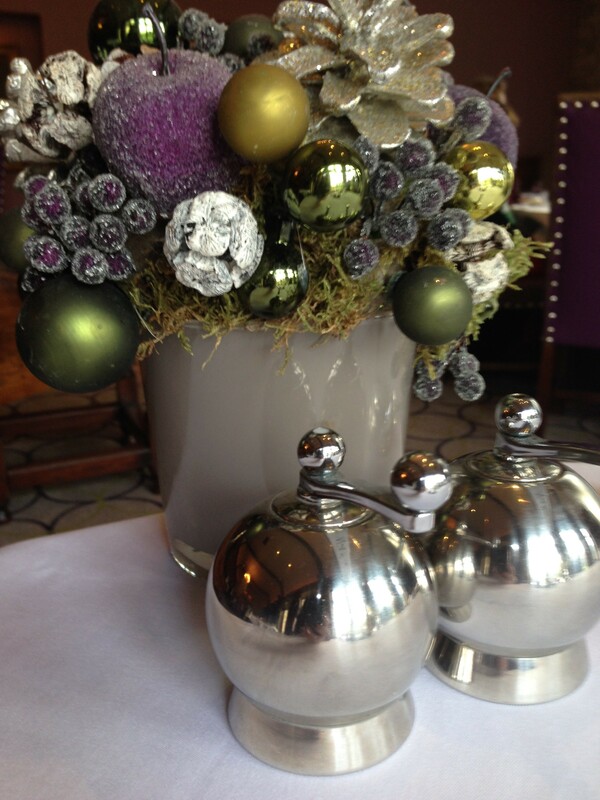 Festive foodie heaven! 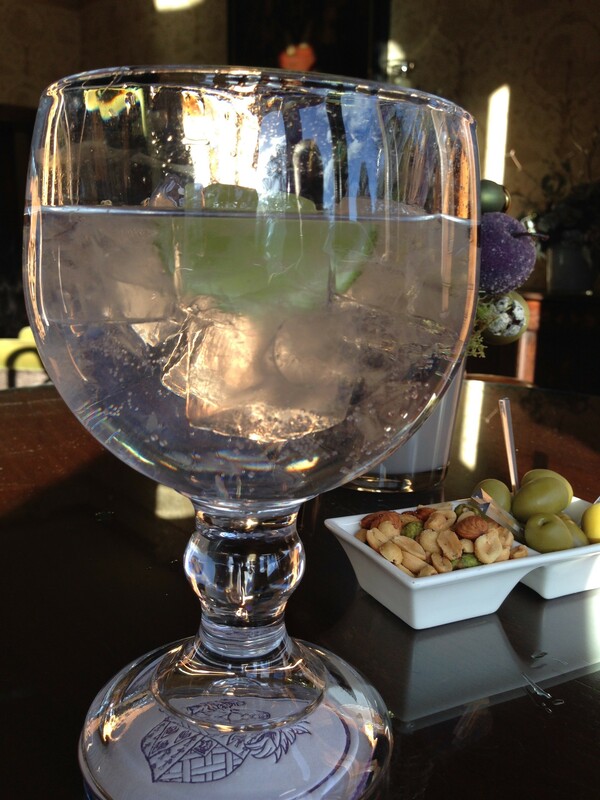 We drove through one of the worst storms I have ever experienced to get there (floods, hail, gales) and so to be met with a gin and tonic, in a goblet the size of a small child’s head, was totally on the money. 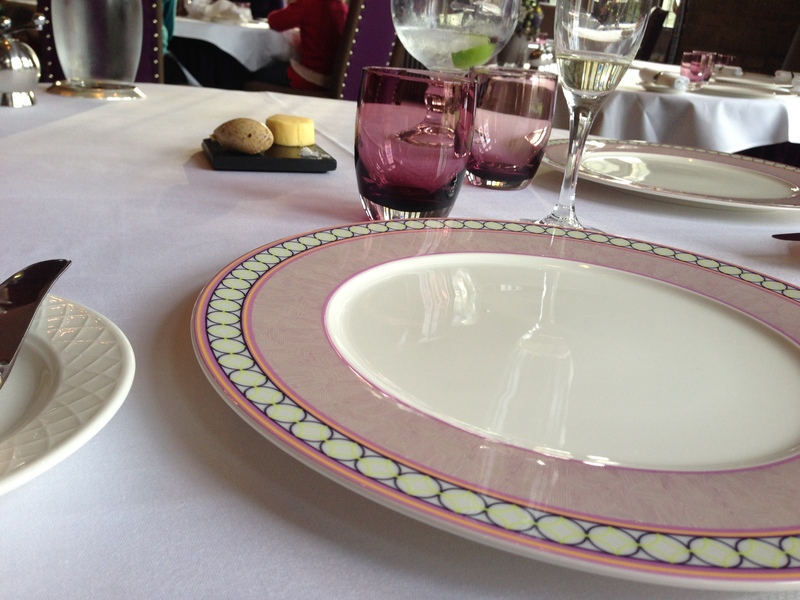 My dining companion was none other than one’s own mother who, for the purpose of this review, we will call Mrs R Snr. Mother likes the finer things in life and was therefore immediately at home in the sumptuous sofas of the Shakespeare Room, complete with said gin and tonic, which is where I left her while I had an explore. You need to leave time to explore leisurely. The Manor House is one of those incredible houses that makes you want to play Lady of the Manor and believe that you actually could be. It’s the type of hotel where you can drift and graze, as if in a time bubble, from delectable breakfast in your suite, to morning coffee in front of a roaring fire, then a stroll around the Italian gardens before returning for lunch, afternoon tea and finally evening drinks and dinner, all in differing divine rooms. Stop for a game of chess in front of leaded windows showing the coats of arms of families gone by. 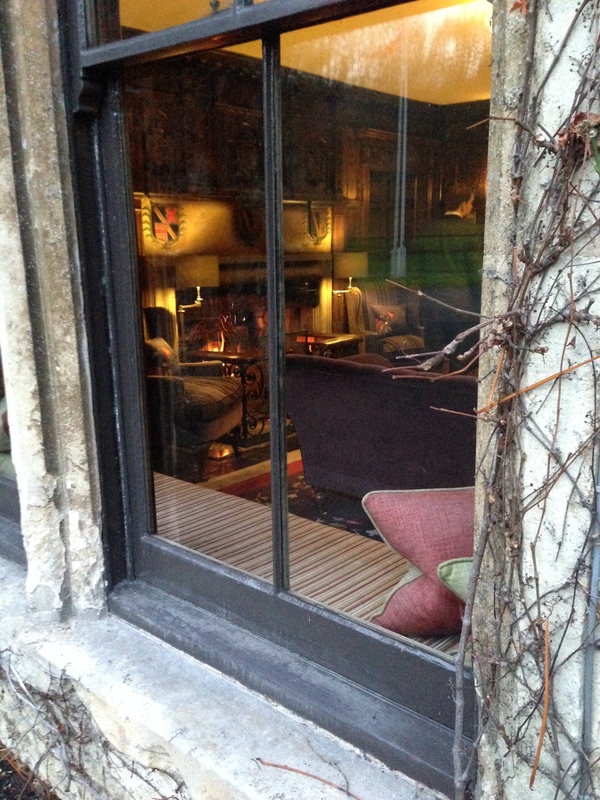 Curl up in a nook behind a pillar with a book for the afternoon in your socks (and hide from the relatives). Dress like a Downton Abbey cast member and sweep into dinner along the flagged hall. Time stops here and at no time is that more evident than on the blustery, rainy day we visited last Friday. 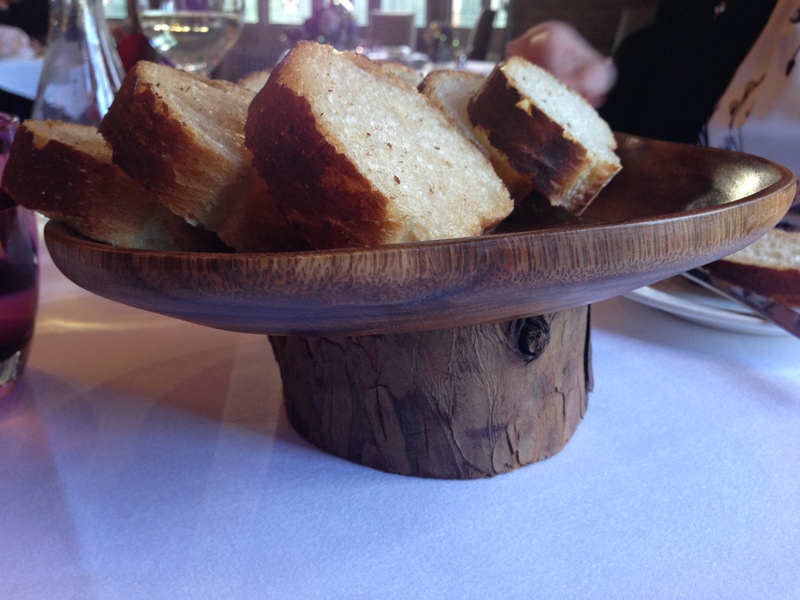 We were served the chef’s own ‘Campo’ bread and this is what tipped us off that we were in for a real treat. The last time I had bread in a five star hotel and it was called ‘rustic’ it was actually so incredible chewy I felt like I was doing battle and abandoned it. This bread was a pleasure all of its own – crispy light crust with melt in your mouth soft as cloud middle. It had the added distinction of being served in a wooden bread basket which had been made by none other than our chef, from wood gathered from the estate! Served with a cep butter it would have been easy to have lunched very simply on this course alone. Sent quickly after the bread came the Chef’s Amuse Bouche, a few delicious mouthfuls of warming confit duck topped with a pumpkin espuma. The taste was a perfect appetiser and wisely we put the bread bowl down and looked forward to our starters, knowing this was a chef who meant business. Mrs R Snr had the Duck Terrine, pressed duck cooked three ways served with splashes of caramelised zesty orange and a fig and port reduction. I managed to spear a fork full before she polished it off and we both agreed that the creamy terrine with the accompaniments was a spectacular starter. 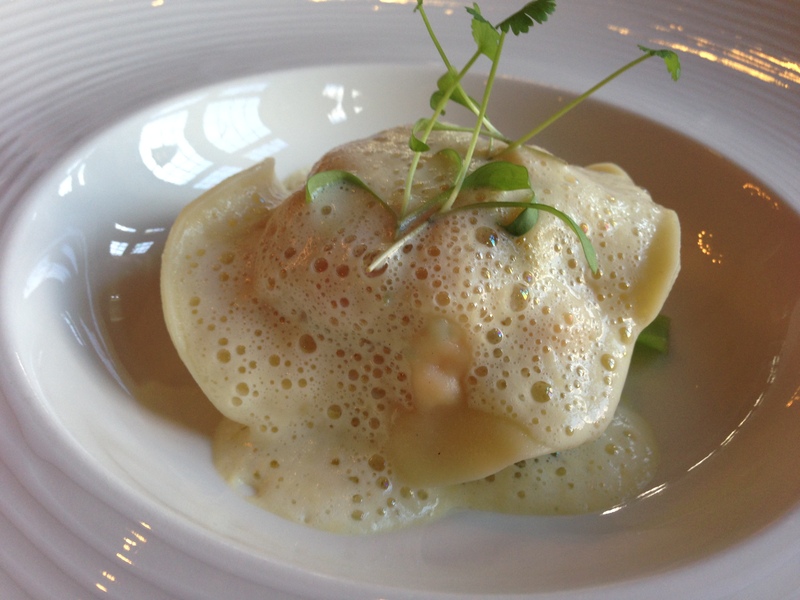 I had the Ravioli of Loch Duart Salmon and Lobster with sweet corn and lemongrass veloute and was most surprised at how ‘meaty’ it was. Rather than the normal mousse you often find inside, which can make ravioli sloppy, the salmon and lobster was still really chunky and actually quite filling and the accompanying lemongrass foam was delicious – subtle and delicately perfumed. As I was driving and Mrs R Snr had already had that titanic G & T, we decided to have just a glass of wine each with our main course and left the choice down to our Sommelier, the charming Ben Porter. The Manor House, like the rest of its sisters in the Exclusive Group, is a champion of all things local and we were therefore intrigued to be served a white wine from the nearby village of Malmesbury. Named ‘Bow-in-the-Cloud‘ we had the Cloud 9 blend of Bacchus, Seyval Blanc and Schonburger which had a freshness we both likened to boiled pear. The Manor House also serve the English Sparkling classic Nyetimber (which Ms S and I will be tasting at a fashion show this Wednesday – dangerous). 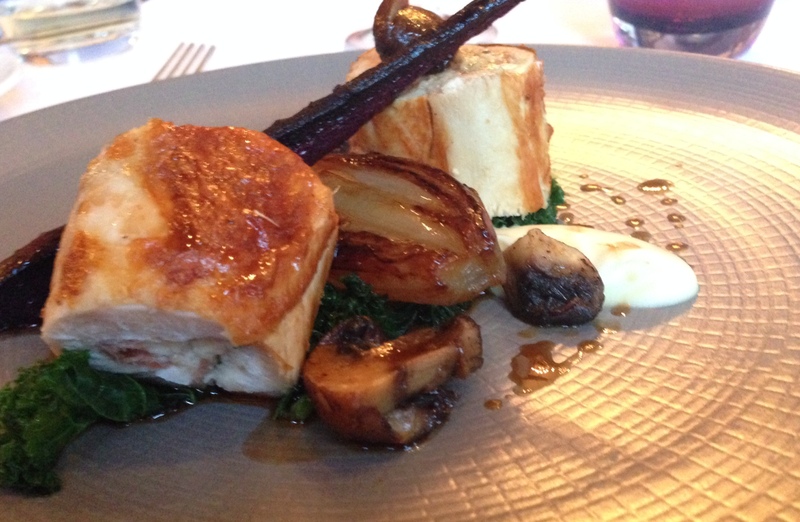 On with our main courses and my chicken dish of Poached and Roasted Chicken with Parsley Root Puree, Garden Greens, Smoked Shallot and Red Wine Jus. Perched on the top was also a long black stick which turned out to be a heritage carrot. I have to say this was one of the best chicken dishes I have eaten. With a presentation worthy of Master Chef the root puree was utterly fabulous and the chicken succulent and full of flavour. The unexpected mushrooms gave a real depth to the dish and the jus lent just enough juice. Richard Davies style is simple but precise. Nothing too busy or fussed over but everything perfectly balanced and cooked expertly with the very best ingredients. I was resistant to give a mouthful away to mother, but because I had to taste her dish to be able to make a comment, a deal had to be done. 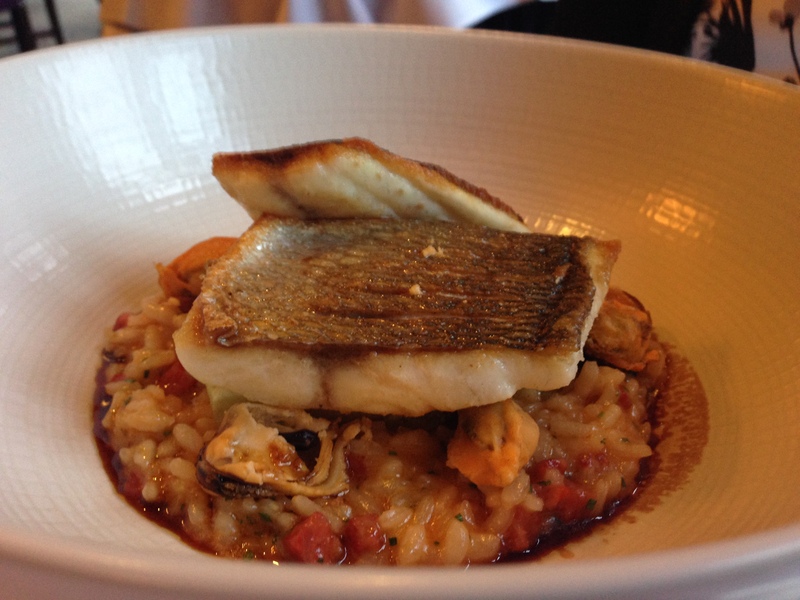 Mrs R Snr had the Pan-fried Fillet Gilt Head Bream with Chorizo Risotto, Smoked Mussels and Braised Gem Lettuce. I have to say I would have been equally happy to have this dish and mother was equally stingy in giving any away. The bream was light and fluffy and the risotto had a fantastic rich smoky flavour without being too salty. The little lettuce surprise underneath the fish lent a third element to the dish that gave it a cheeky crunch. My only tiny gripe was the bowl the bream was served in made it tricky to get a good fork-full as the sides were so steep, but this at least saved mother from giving too much away to me. Feeling very pleasantly relaxed and replete we went back to the Market Menu for desserts. 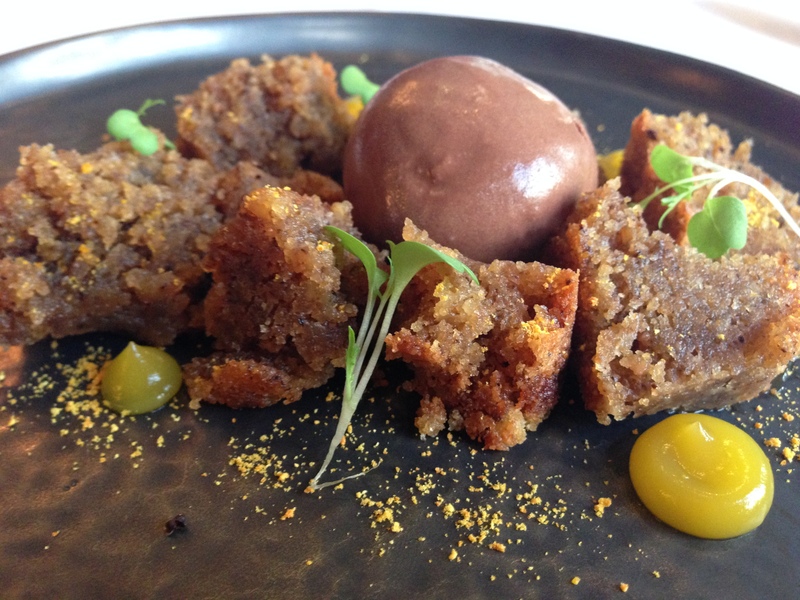 I chose the Walnut Cake with Chocolate Ice-Cream and Mrs R Snr the Vanilla Creme Brulee with Raspberry Sorbet. The Walnut Cake had a touch of spice which I failed to identify but it had a very seasonal flavour. It was crunchy and crumbly without being dry with lovely sharp drops of orange jelly and the chocolate ice-cream was intensely rich without being bitter. 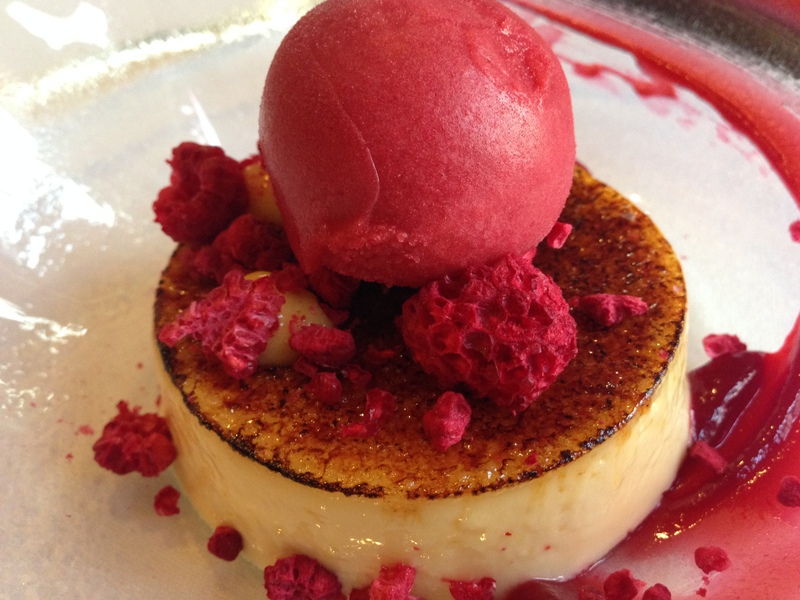 Mrs R Snr thought the Brulee was utterly scrumptious, creamy and mellow with the tarty dried raspberries and sharp sorbet as concentrated bursts to the pallate. She is a fan of berries but I found the sorbet a little too tart for my tastes. The brulee though was glorious and the sweet, delicate crust was a fragile gossamer thin crunch. It also looked exquisite! We chose our tea from the very extensive menu and sat back to enjoy the sound of families relaxing into a long, lazy afternoon as the watery sunlight still washed the room with a faint glow. The Manor House is set in 365 acres (one for each day of the year?) with the river Bybrook running through it. Guests can fish for brown trout, or hire bikes to explore the grounds. During the summer the croquet lawn comes into its own and the setting could not be more perfect for a romantic country wedding. The staff must also have a mention as they make you feel like you are old friends, but without wanting to join your party if you know what I mean? After enjoying our tea and precious little petits fours (the macadamia was paradise in two bites) we decided to venture out and try and find the micro-veg garden. After climbing a few terraces we instead came across bee hives from which we beat a hasty retreat. Unfortunately the light had gone so I can’t show you our posing photos taken on the Italian garden steps but can instead share with you our backward glance as we left the comfort of the hotel and headed out into the windy afternoon – our sneaky peak through the window as we looked longingly back at the fire and warmth we had left. Truly one of the best all-round meals I have had in one of the most stunning settings I have ever seen. I am besotted. Design Restaurants members dine complimentary in The Bybrook when joined by at least one full paying guest for lunch Tuesday to Saturday and dinner Sunday to Friday. Find out how to join at www.designrestaurants.com. Mrs R and Mrs R Snr were guests of The Manor House and dined from The Market Menu, £25 for two course and £30 for three. Design Restaurants members would dine for £15 per head for three courses when two people dine using their card. 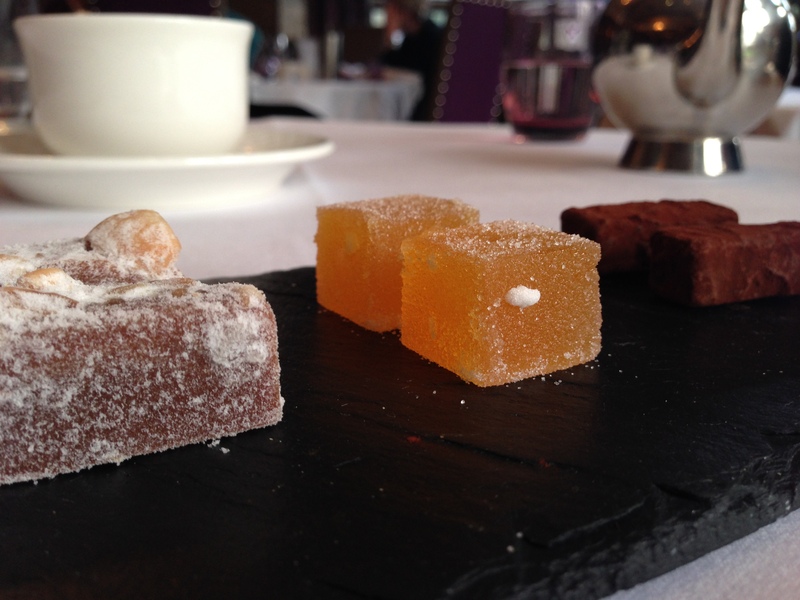 A great review of The Manor House-makes me want to go and enjoy afternoon tea whilst sitting by that gorgeous fire. But, LOCK Duart-really?!!!! Ooh good spot – amended! Love, love, love this place!! Do they accept well-behaved dogs?? Actually they do!! At Christmas the dogs all had their own stockings… how cute is that? !